Yo ho, yo ho, a pirate's life for me. 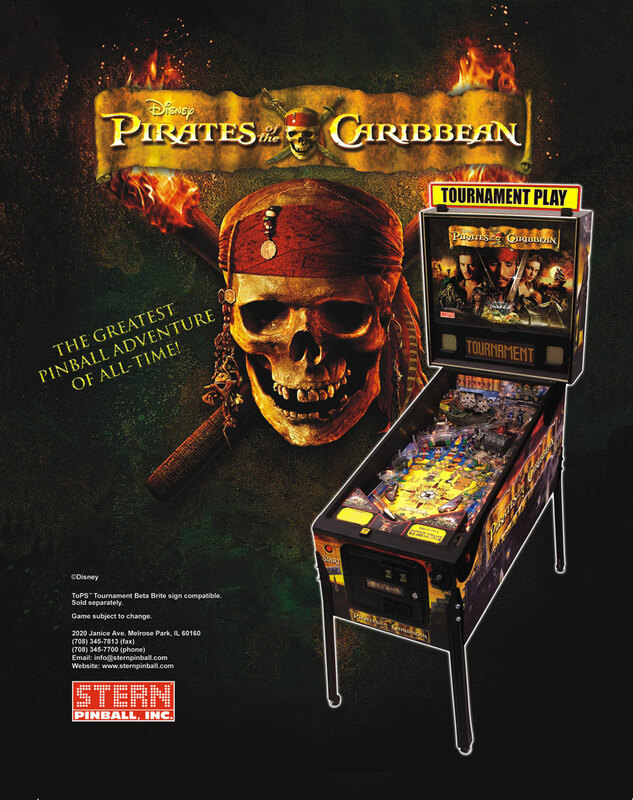 Stern Pinball in 2006 released Disney's Pirates of the Caribbean based on the first 2 movies at the time The Curse of the Black Pearl, & Dead Man's Chest. With majority of the focus on the 2nd film featuring Davey Jones. Since that time Disney had two other Pirate movies "At Worlds End", and "On Stranger Tides". Another pirates flick is currently in production the 5th installment titled "Dead Men Tell No Tales", which would be released roughly sometime in the summer of 2016. Did Stern Pinball predict the future almost 10 years in advance ? One of the call outs in the game from 2006 the parrot says "Dead Men Tell No Tales". I thought it was neat that the POTC game I bought was from someone who actually worked on the first two movies as part of the filming crew. This was my first "Stern" Pinball machine, In this post your not going to really see many restoration photos because I bought the game already in excellent playable condition. The pinball artwork on the playfield is done very nicely with the bottom half which looks like an old treasure map. Being that this game is a Disney game it has a few hidden Mickeys throughout the playfield. Do you see the hidden Mickey's below? For those that don't know what a hidden Mickey is it's essentially is a representation of Mickey Mouse that has been inserted subtly into the design. The translite image on the chest the lock is a mickey head, along with the chest lock on the playfield. The other hidden mickey is in the coins by the flippers. Also to note if your a Disney fan likely you already knew this but the original Pirates of the Caribbean attraction at Disneyland, which opened in 1967, was the last attraction whose construction was overseen by Walt Disney himself; he died three months before it opened. The ride, which originally told the story of a band of pirates including their troubles and their exploits, was replicated at the Magic Kingdom (my favorite theme park!) in 1973, at Tokyo Disneyland in 1983, and at Disneyland Paris in 1992. Each version of the ride has a different facade, but has a similar ride experience. The top half of the playfield is basically filled with various toys one of which is the flying dutchman. Davey Jones ship aka the Flying Dutchman. Your objective is to hit the ship, the sails will actually fall down via a solenoid, and the coolest part once you sink the ship it literally goes down into the playfield revealing the kraken behind it. The kraken to be honest was rather a big disappointment just a few layers of plastic, they definitely cut corners to save money and it shows. The game will start a 4 ball multi ball to help you defeat him however you need to hit Davey Jones aka the Flying Dutchman while the ship is level. The ship will be bobbing up and down which makes the timing much more challenging. Also to note that if you take your sweet time Davey Jones will regenerate his strength so you need to hit his ship multiple times within a few seconds to defeat him. A few tips in the game I can give is that try to earn extra balls by hitting the treasure targets on the side, also going up the Port Royal / Tortuga ramp will start to lock up and create a maximum 4 multi ball, that will also help you greatly while defeating Davey Jones. The games main objection is to complete the compass on the playfield and get to "Four Winds Multi-Ball". 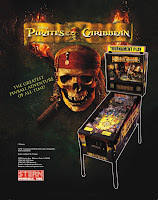 This can be a very challenging task In order to do so you need hit all pirate targets, activate max jackpot value, port royal, sink a ship, collect crew, sword fight, light special, destroy a kraken, light the extra ball, defeat Davey Jones, capture Jack the monkey, heart super jackpot. I would say that defeating Davey Jones is generally the toughest thing to complete on the compass followed by Jack the Monkey, and Heart Super Jackpot. I added Jolly Roger logos to the coin slots on the coin door. My game also came with a few additions and mods that were tastefully done. Some of which included Large Dutchman Cannon, Mini Pearl Cannons, Sand and Barrels, all from Back Alley Creations. Coin Taker LED's installed. The game also has upgraded speakers from Flipper Fidelity which sound great! I did however install a flipper rebuild kit as the flippers were starting to stick and now work perfectly. Instead of having tons of lights on the backbox, the Stern games feature one florescent tube. The game is running the latest code, but if needed the S.A.M. System (Gary Stern's Dad) is rather easy to update. The game play is not a run and gun fast action game it starts off rather slow and some people want action all the time but i like the fact that it has a different type of game play than other machines. POTC has an excellent fun factor, great theme even if your not a fan of the movies and funny call outs, cool toys, fairly challenging to get to four winds despite the various stop and go.